What’s so hard with punishing KCM. Cause all we hear are warnings when they KCM themselves are not even moved by the same warnings by our government. Sly Indian devil Anil Agarwal does not need appointment to go to State House he simply walks in even when the Indian President was here he simply gatecrashed as in India he has no chance of sitting on the table with his President. …there is your answer. Well done, Maiko. Unlike your colleagues like Laura Miti who focus on politics rather than noble causes like these. Sit with EAZ and Dr. Haabazoka and help the people hold the corrupt mines accountable for their thieving actions. This is why I always state that you are thick as porridge…Why is demonstrating on fiscal indiscipline and accountability not noble…you are good at using words you don’t understand like Patriotic and nationalists …yet this govt you support is the most unpatriotic govt I have ever seen..every African I meet today abroad always asks me why we have let our corrupt leaders sell the country to the Chinks…even RSA Development bank is threatening to recall back loans as PF has let Chinese take over all programmes. Sad that your opinion and that of your fellow white bottom cleaners in diaspora doesn’t matter as Zambians continue to endorse the PF. Your hatred for our leadership is yours as you continue filling your head with sh!t from Zambian Witchdoctor and other fake news outlets. No one hates the the leadership..people hate deceitfulness, corruption, incompetence, recklessness and laziness of Lazy Lung’s regime. How would you know what a bottom cleaner is if you have never stepped on an inter continental flight…you think everyone in diaspora is working in care home..really laughable..i bet you the same bottom cleaners get paid more than you get from Sunday Chanda’s crumbs that fall off his table. 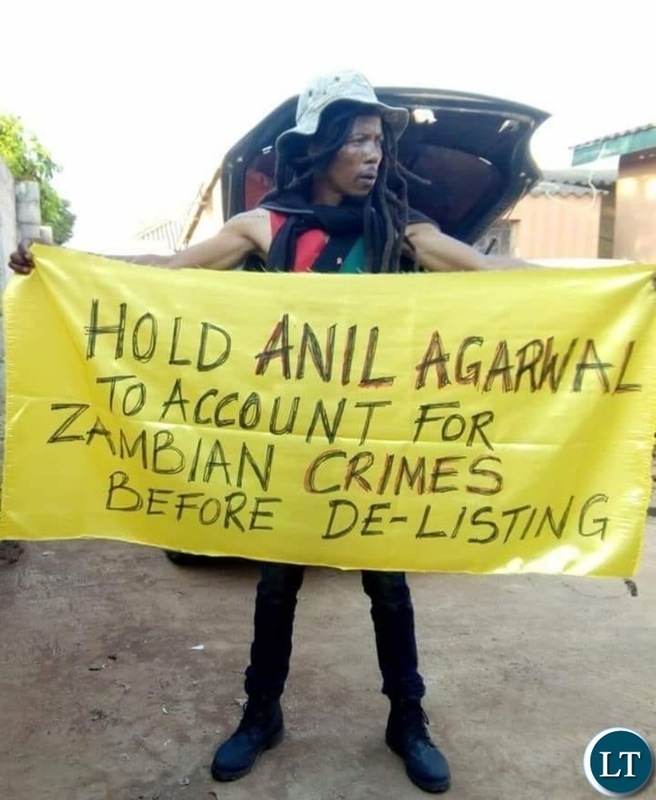 Zambia will forever remember you for this. KCM is a collection of white caller criminals, the owner dubbed the government to buy the biggest mine in Zambia cashless and further has continued to steal from our resources and indeed our people on a number of taxes etc. Noble soldier. Rasta fight on! “…uninformed police officers arrived and told him to leave since he had no permit to protest”. What were they uninformed about? Viva Zulu! Viva umurasta! Viva umuntu wesu! Abash Zambia Police! Abash KCM! I wonder where it says you need a permit to demonstrate in the constitution and I wonder how a lone protester can endanger peace!! 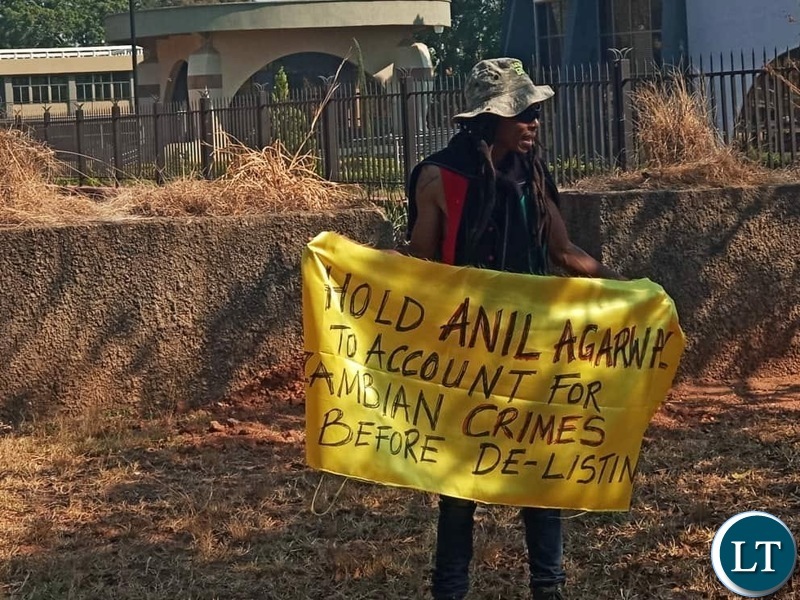 That’s Zambians for you they will simply watch behind the bush and see how things pan out when you demonstrate..they will never join you or even send a lawyer when you are arrested and [email protected] in a st1nking cramped cell. 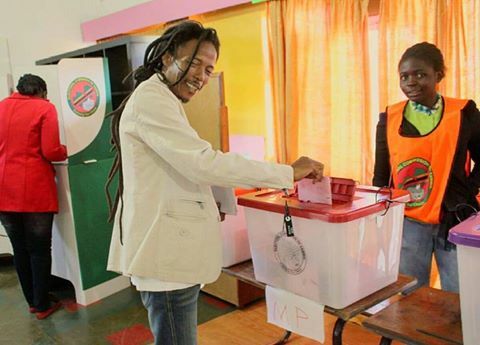 Here is Maiko Zulu, who stood as a candidate for Kabwata an area where he grew up …the guy knows the area and what should be down but as we know with us Zambians we dont want to see our friends achieve their goals its like that with tenders as well we would rather let a foreigner do the job…the docile Zambians voted for the coward Bo Lubinda and gave every excuse about Maiko even his appearance was questioned as not fitting for Parley…today they are here praising him without shame.